The Zurich Chess Challenge 2014 will commence on Wednesday, 29 of January 2014 at the city’s Hotel Savoy. It is going to be the first ever chess tournament in the chess history to reach category 23 with a remarkable average rating of 2801. The Zurich Chess Challenge 2014 will see the glamorous presence of the newly crowned world-champion Magnus Carlsen. 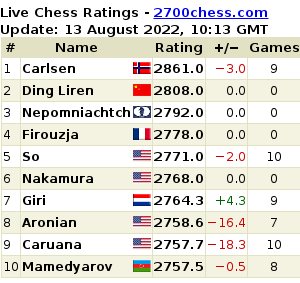 The 23-year old Norwegian star player will compete against his predecessors and former world-champion, Viswanathan Anand of India (number 9 in the world-ranking), the Armenian Levon Aronian (2), the American Hikura Nakamura (3), the US-Italian Fabiano Caruana (6), and also the Israeli Boris Gelfand (8). Zurich Chess Challenge 2014 promises to be a sparkling event and will be an attraction to both the locals and the tourists alike. This extraordinary occasion will be held at the ancestral environment of the ballroom of the Hotel Savoy. The happening is thought to be calling in many journalists and top-players from throughout the world, to name a few such as Peter Leko, Jan Timman and Gennadi Sosonko. Added to that, the Chinese women’s world-champion Hou Yifan will also glorify this marvelous occasion and will be playing a simultaneous exhibition against 6 top Swiss juniors on 1 February at 1 p.m. at the Zurich “Zunfthaus zur Saffran”. The “Zurich Chess Challenge 2014″, will kick start with a blitz tournament on the first day and finally five rounds of classical chess will be played from to (30 January, Thursday to 3 February, Monday, followed by a rapid tournament on the last day that is 4 February. All games of the Zurich Chess Challenge 2014 will be commented live by GM Yannick Pelletier and IM Werner Hug and also broadcasted world-wide live via Internet on www.zurich-cc.com. The Zurich Chess Club has a rich history; it was founded in 1809 and is considered to be the oldest active chess club of the world. Since then the club has a long-standing tradition of hosting top-level tournaments.